dairy herd and to monitor the effects. access to Out Of Parlour Feeders (OOPF) with MultiDos Liquid Feeder. • “Hanskamp Multodos” Liquid Feeder on the OOPF, liquid feed delivery. Dry Cows and maternity pen had no access to OOPF. This continued until day 20 of lactation, or longer as they exceeded a certain milk yield; i.e 35L/day for lactation 1, 45L/day for later lactations. The college’s Afilab system was used to analyse milk, target the feed and present the results. From this trial on a college dairy farm under commercial conditions, we can see how the herd’s performance changed over time. Conception and pregnancy rates both improved after an expected lag phase. The 20% increase in conception rate, when extrapolated forward improves the calving index by 40 days, saving over £20000 annually, without considering reduced cows culled. Hormone medicine use reduced by over 50% saving 10 treatments per month approximating to saving of £1200 per year in cost of veterinary time & medicines. This herds milk contract did not pay extra for the 0.1% increase in milk protein content, but this shows that energy supply and utilisation were improved. The introduction of OOPF concentrate feeding showed improvement, but the gains continued following use of the NRG liquid feed. Milk yield kg/cow/day showed a variable curve prior to NRG Liquid Feeding, but remained consistently high during the period that it was fed. 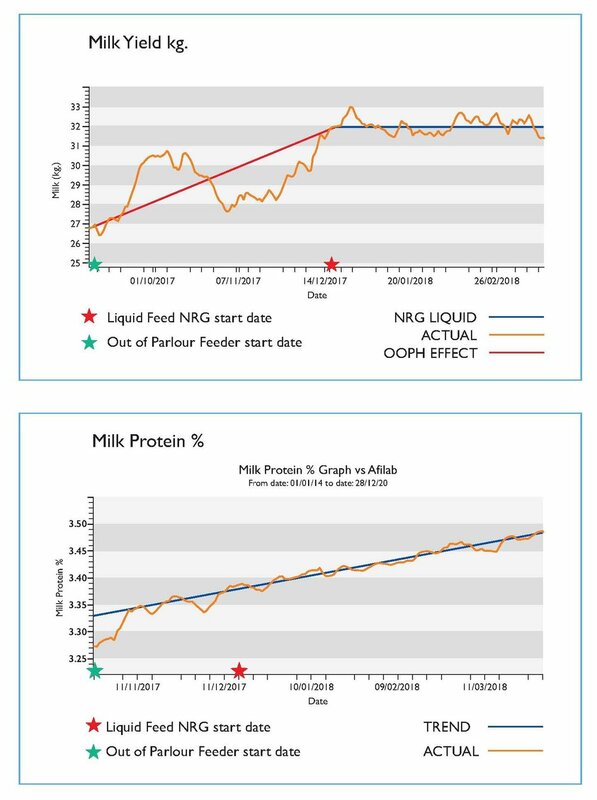 Improved yield across the herd of 5L/cow/day contributed a considerable extra income to the herd, although this would be offset by extra nutrition cost for 3 of the extra litres above the 2L of energy from the NRG Liquid. We calculalate the benefit to be £38000. The sum of these benefits total to £59200 after extra concentrates deducted.